Using this guide you can explore over 75 waterfalls stretched across the Mountain State. The hikes range from quarter-mile jaunts to 14-mile treks, though most are on the shorter side. Waterfalls are special – arguably the most enchanting spectacle in nature. At their most basic, they are simply falling water, yet after coming upon a waterfall, we are captivated and happily surprised at their transitory beauty. Moreover, when combining waterfalls with hiking you construct a superlative outdoor experience. Hiking to a waterfall adds a reward at the end of the trail for your efforts. Additionally, while hiking to waterfalls you will likely see other jewels in the sparking crown of nature. Although simply moving water, waterfalls display a variety of characteristics – whether it is the wide, low tumble of Big Beechy Falls near Marlinton, or the high and powerful roar of Sandstone Falls on the New River, or the delicate descent of White Oak Falls along the Bluestone River. Perhaps the variety of cataracts found along Seneca Creek comes to mind, or the geological ruggedness of High Falls on Shavers Fork. Maybe you think of the oft-photographed cataracts at Blackwater Falls State Park. And there is more – for the hikes along the way to the waterfalls harbor additional rewards – walk the giant hiker suspension bridge on the way to Otter Creek Falls, soak in the spectacular scenery of Dolly Sods Wilderness en route to Big Stonecoal Falls, or enter the imposing mountain-bordered and magnificently forested valley of the Cranberry River heading to Middle Fork Falls and Hell For Certain Falls. Each place is further enhanced by having both waterfalls and other superlative natural features we can enjoy on our hike. Using this guide you can explore over 75 waterfalls stretched across the Mountain State. The hikes range from quarter-mile jaunts to 14-mile treks, though most are on the shorter side. Let’s face it: in our rush-rush electronic universe we are hurriedly looking for an authority, “someone who knows” to help us pursue our goal of hiking to West Virginia’s waterfalls. This is my approach: Imagine you and me relaxing around a campfire, and you ask about the best waterfall hikes in West Virginia. I tell you as one friend would to another, rather than reading like a dry, dull textbook. West Virginia’s waterfalls are too captivating for that! 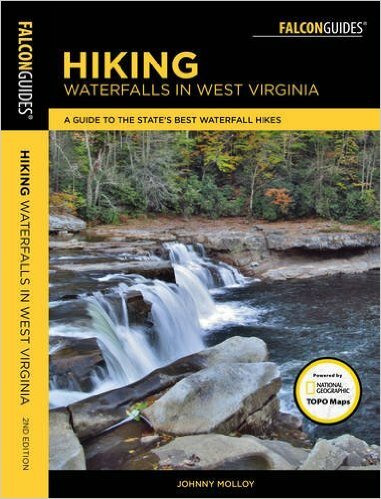 This guide conveys concise, organized information to help busy people make the most of their limited and precious outdoor recreation time, and provides an opportunity to experience the best waterfall hikes that can be had in the Mountain State.